ALBANY, 01/28/14 -- State Senator James L. Seward (R/C/I – Oneonta) today welcomed Acting Commissioner of the New York State Department of Agriculture and Markets Richard Ball to the senate agriculture committee’s first meeting of the year. 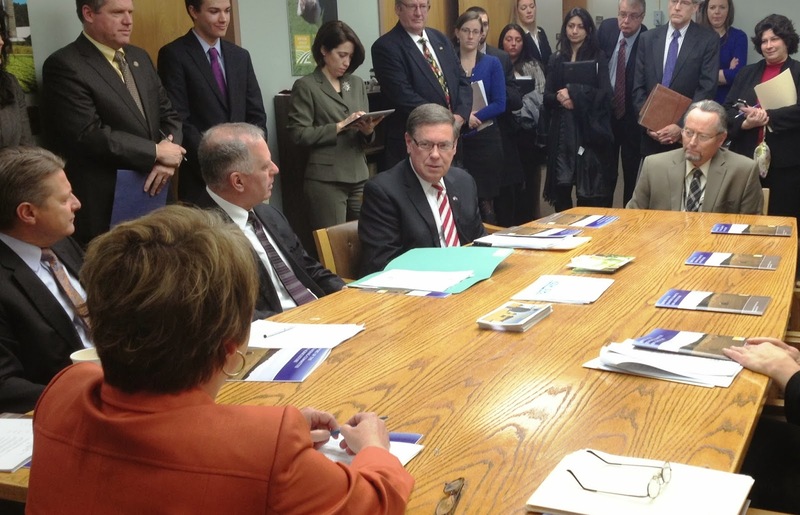 Photo attached, from right: Acting Commissioner Richard Ball speaks with senate agriculture committee members, Senator James Seward, Senator Michael Ranzenhofer, Senator Patrick Gallivan, and Senator Patty Ritchie, chairman of the senate agriculture committee. Acting Commissioner Ball spoke briefly with the committee members and provided some background on his experiences running a farm and retail operation in Schoharie County. Formal senate confirmation of Ball’s nomination will take place later this year.